Luckily, it afforded me lots of time to sit on the couch and surf Pinterest. Isn’t that what you do when you’re sick? Look at pictures of things you wish you could get off the couch and create but in reality your aching head says no friggin’ way? Toward the end of our quarantine, we felt well enough to give these krispie treats a try. They’ll come together in 15 minutes and are perfect for your little helpers. 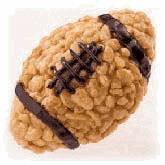 I put plastic baggies on their hands, secured loosely with hair ties, and let ’em rip shaping the treats into footballs. In addition to footballs, I also have an array of snowmen, pancake and soccer ball shapes…let their creativity run wild. I used these Betty Crocker pre-made piping bags to garnish with the football markings. We used a blend of regular and cocoa krispies to cut the sweetness, but for an authentic football look use all cocoa krispies and white icing. Melt the butter over low heat. Add marshmallows. Stir until completely melted and remove from heat. Stir in peanut butter until melted. Add cereal and coat well. Cool slightly. Cover hands with plastic gloves or bags to shape mixture into 16 three-inch footballs. Cool and then, decorate with frosting. Here are the ones the kids helped with…not too bad, right?